From a small standard rhib which offered no protection for the crew, nowadays a rhib should be a more flexible multirole platform where modularity and multirole is very important in order to adapt to the different evolving situations. The required role can be very diverse, from riverine operations, beaching and landing to high speed interception and offshore patrolling. The MRCD1100 MPAC Mid Engines has the console and engines in the middle. Because of this layout the crew and embarked forces are positioned in the most aft position possible and therefore they experience the less vertical accelarations. Another benefit is that that all the crew and embarked forces are protected against the elements and even against unfriendly fire by the large wrap around console. The MRC1300 MPAC combines high speed and redundancy of 4 outboard engines together with a fully bullet resistant platform. From a small standard rhib which offered no protection for the crew, nowadays a rhib should be a more flexible multirole platform where modularity and multirole is very important in order to adapt to the different evolving situations. In the MRCD1300 MPAC all the crew and embarked forces are protected against the elements and even against unfriendly fire by the large wrap around console. Because of the wrap around console a center path throughout the whole boat is created. 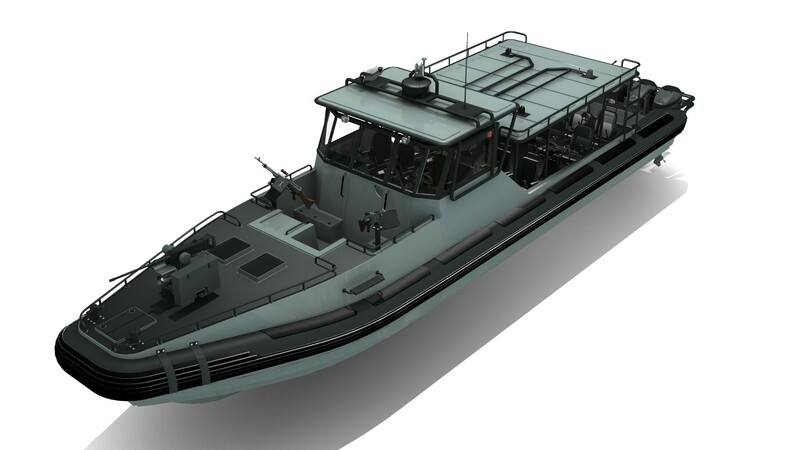 The MRCD1500 MPAC is a fast all round assault boat which has a speed of +60 knots and can move 2 + 12 pax on comfortable suspended helm seats. The MRCD1500 can be made bullet proof in 30 seconds. It has a Remote Weapon Station (RWS), smoke grenades and 4 additional gunpost which together makes this a perfect gun support vessel. The MRCD1500 MPAC is a fast all round assault boat which has a speed of +50 knots and can move 2 + 12 pax on comfortable suspended helm seats. The MRCD1500 can be made bullet proof in 30 seconds. 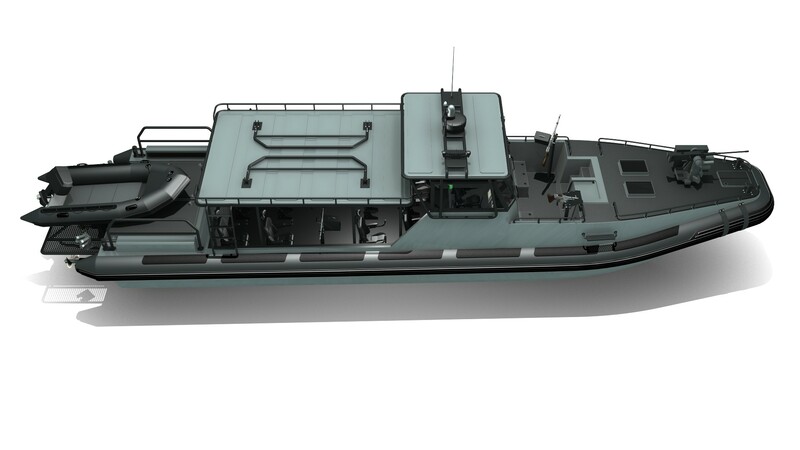 The MRCD1500 MPAC is a fast all round assault boat which has a speed of +60 knots and can move 2 + 12 pax on comfortable suspended helm seats. The MRCD1500 can be made bullet proof in 30 seconds. The MRCD1500 MPAC is a fast all round assault boat which has a speed of +50 knots and can move 2 + 8 pax on comfortable suspended helm seats. This version can carry two fully inflatable boats, which makes it perfect for mission which involves a Delta, river or beaching. All round heavy duty Military boat. Layout, options and engines can be choosen by the customer. It can be fitted with: Single lifting point, Foam tubes, Foam/Air tubes, Automatic inflation system, Waterjets or sterndrives, Shorepower, Generator, Small crane, Self righting system, Quick Release Single lifting hook. All round heavy duty Military boat can be transported in a 40ft container Layout, options and engines can be choosen by the customer. It can be fitted with: Foam tubes, Foam/Air tubes, Automatic inflation system, Waterjets or sterndrives, Shorepower. Made for DEMO purposes. MRC1050 Commando with the Madera offshore hull. A very robust and multi functional work or military RIB. Can be fitted out with 2 or 3 powerfull outboard engines up to 350HP each. Can be fitted up to 2 + 12 seats. All round heavy duty Military boat. Layout, options and engines can be choosen by the customer. It can be fitted with: Foam tubes, Foam/Air tubes, Automatic inflation system, Waterjets or sterndrives, Shorepower, Generator. 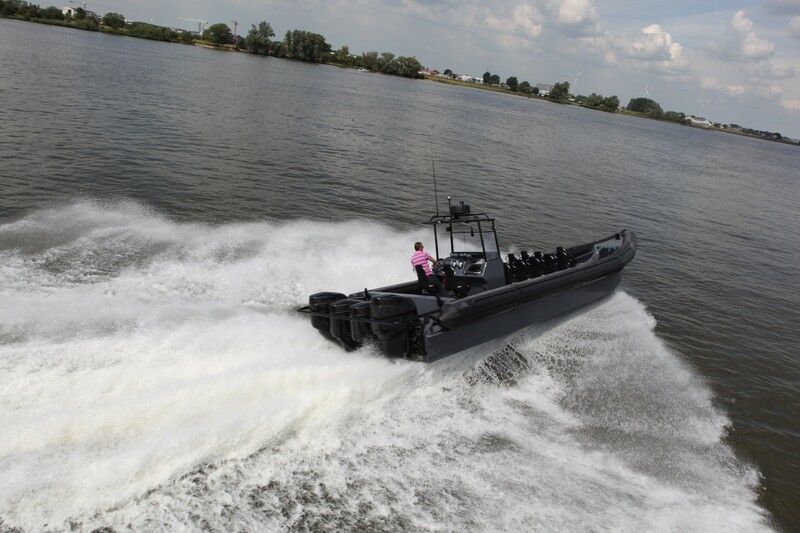 An all round heavy duty Military boat for offshore patroling or boarding. Powered with 2 or 3 inboard diesel engines, or a maximum of 4 outboard engines. Layout, options and engines can be choosen by the customer.